Attend another Rotary Club meeting anywhere in the world and bring a written record of such attendance back to the club secretary. Rotary club locations, meeting times and locations, can be obtained from both the District 5970 and International web-sites. Attend/Participate in a Rotary committee, board, or work session – Club, District, or International. Attending an Interact meeting is a good way to obtain at least one meeting make-up. 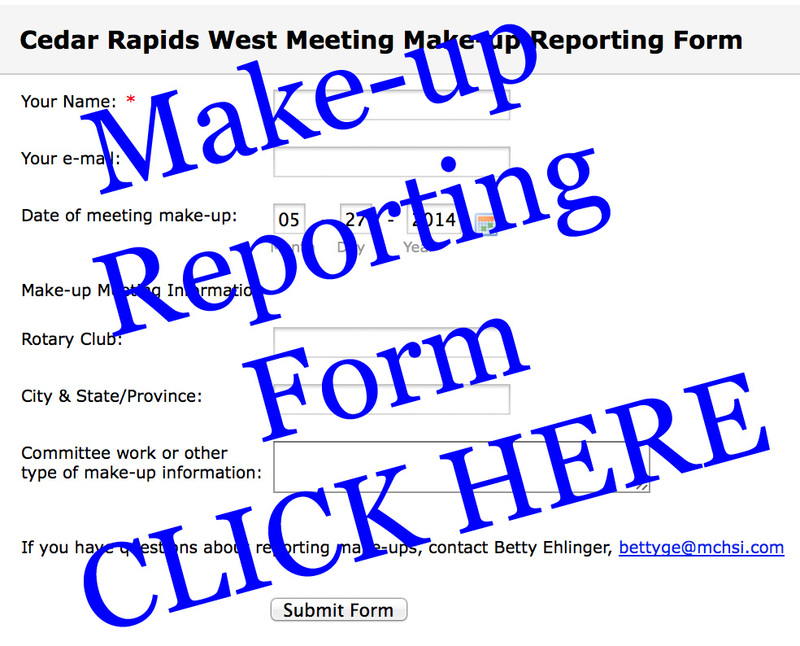 Attend/Participate in a "special" Rotary meeting make-up opportunity that may be held at a state or national function such as the Iowa State Fair, RAGBRI, Cruise Ship, etc. Participate in "Rotary e-Club One." This is a web-based Rotary Club that can be accessed at www.rotaryeclubone.org. Obviously, this site is available 24 hours a day, 7 days a week. Simply follow the instructions, complete the task(s), and obtain your printed "attendance record" for the club secretary. For the times of other clubs, use Rotary International's Club Locator or emakeups.